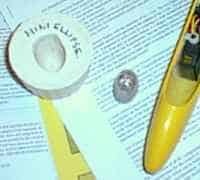 Here’s a simple method of casting lead to fit inside the nose of your model. It could also be used to for casting shaped ballast slabs to fit in the fuselage. 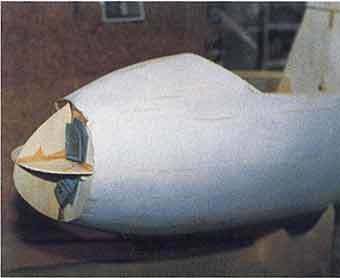 Making the mouldThe method is suited for glass fibre fuselages where access to the nose is restricted. I don’t pretend it’s the only way, but it works for me – I don’t pour molten lead directly into the nose cavity, as some folks do! 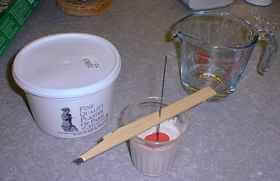 Photo at right shows plastic cup with plaster of paris and the modelling clay (red). Note: I’ve since found the wire and balsa are not necessary to support the Plasticene. Take a lump of modelling clay a little larger than the volume of the nose. Wrap in clingfilm. Push the clay and clingfilm as far down the nose as possible, so the clay takes on the internal shape of the nose volume, then remove and unwrap the clingfilm. We now have a clay plug the exact shape of the inside of the nose. Mix up some plaster of paris in the plastic beaker, about twice as deep as the plug. Gently place the plug in the wet plaster, support if necessary to prevent it sinking (it shouldn’t sink since it’s about the same density as the plaster mixture). Put aside till the plaster sets. See picture above. When plaster has set, ease out the clay. The clay shouldn’t stick to the plaster, so this step is easy. We now have a mould for casting the lead. When the plaster is completely dry, tap out from the beaker. It’s important that the isn’t mould is bone dry when you pour in the lead, otherwise you could end up wearing a lead suit… you have been warned! If necessary, place the plaster mould in the oven at a low heat, until the last of the moisture is driven off. Melt the required weight of lead, and decant it into the mould. Wait to cool then invert mould and tap gently till lead casting drops out. And that’s it! Before setting, it is malleable enough to flow into the spaces in the nose area and fill them up completely. Additionally, this system allows you to screw chunks of lead to the front side of the first former (thus effectively lengthening the moment arm) and then to allow the filler to flow over the lead, locking it all into place. If the model is large, you will need to do it in stages, as the weight of a large amount of un-hardened body filler will be profoundly affected by gravity, allowing unsightly bulges to develop which will then need correspondingly large amounts of elbow grease to get rid of. The best way to achieve the desired result is to glue in plywood profiles, both horizontal and vertical to give the filler something to lay on and which during the sanding process will give you something to shape to.